Do we even design for crisis? After a lengthly research process and soaking up 3 semi-relevant articles, 1 episode on 1 podcast and 1 YouTube presentation, I quickly realized that the resources for the concept of designing for crisis is lacking. There is little to no tangible information and research that designers can sink their teeth into. With a lack of research and information on this subject this would suggest a lack of designing for crisis in the Graphic Design industry. I have found this to be true while researching many final websites that should be crisis centered and simply are not. As designers, how do we design for CRISIS? We look at what the specific, PRIMARY need is for the user. Keep in mind there may be multiple needs for the user, try to pic k out the top 3 if that is the case and address them. In tandem, we would ask, what is the one reason that someone is reaching out to us. Wether it is for assistance with a natural disaster, a violent attack, a medical need or a man made disaster, the focus always needs to be on the end user. What are the user’s perceptions during/after the crisis, what is the user’s direct need, whats is their cognitive level of understanding and what is the most logistical navigation for the site/ product/ service. It has been proven that in a crisis or trauma event our cognitive abilities substantially decreased. If we do not consider these factors while designing we are essentially neglecting the user and their needs. Tangible UX application for a crisis centered design. With out designers naturally and intuitively syncing with users, crisis design is lost in non-crisis interests. Some points that need to be considered are the processes an individual is going through during the time of crisis, the needs of the crisis user and the personas of a potential crisis user. What are some steps the user may take while looking for assistance? This is where a Storyboard approach would benefit the solution and direction of the design. 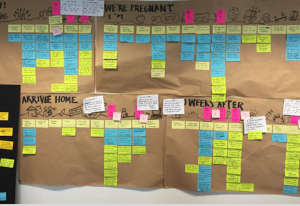 This Story Board approach allows you to use the traditional sense of storyboarding but by using sticky notes and words in the UX version instead on full sketches as we see in the film industry. The Story Board process can be done by an individual or by a team. The designer(s) would need to figure out where the user would start before using this product/service as they write their first sticky note. The sticky notes are used to document each step the user needs to go through while using the platform, service or product. One sticky note represents one step in the user process. The entire user experience would be documented from start to finish with sticky notes. Once each person is done with Storyboarding (should take 20 minutes or less) the entire team should come together with their sticky notes and assist in coming up with an overall agreed upon journey for that persona going through the process (of using the service or product) in a state of crisis. If you are creating a Story Board alone make sure you try to hit every step of the users’s process and I suggest to have another person review the process to make sure you didn’t leave anything out. Many heads are better then one! After the final Story Board is made, you will find some hidden areas where useful design solutions are needed for the best possible outcome. The journey may show you areas you did not already consider. After you have collected all of your data you would move on to creating a site map, wire-frames and a full concept.